Confused while choosing your next car? Want to buy a car that’s cost efficient in long run? Here’s a simple way to find this out. 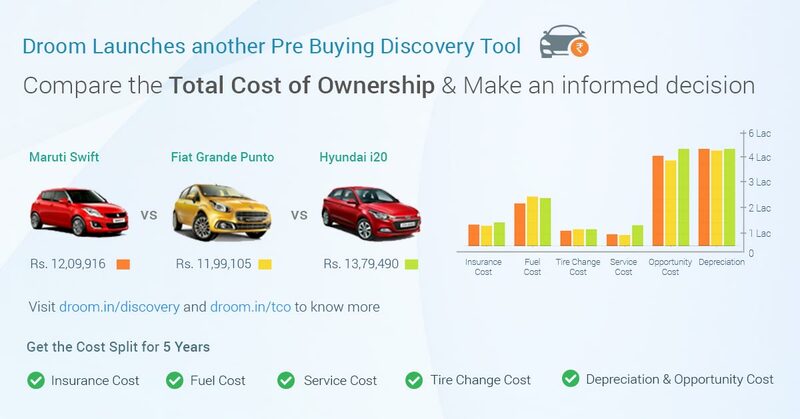 Droom, India’s first marketplace to buy and sell new and used automobiles launches an amazing tool for car seekers – Total Cost of Ownership (TCO). Droom Total Cost of Ownership is a pre buying research tool under Droom Discovery that enables a user to calculate and compare the total cost of ownership of up to three cars for a period of five years. This simple yet technological driven tool provides buyers with an approximate expense of the car based on usage (in form of kms driven) for the next five years. TCO is a great tool for you when you are confused while buying a car. You can easily compare the cost of ownership of a car for next five years, which can really help in making an informed decision. You can give make, model, and trim of the cars along with the monthly running (in kms) for a vehicle as the input values for this tool in order to compare the cars. TCO compares the cars on the basis of insurance cost, tire change expenses, insurance premium expense, service expenses and cost of fuel for a period of five years. The tool gives output in the form of graphical representation showing comparison of various costs and the total cost of ownership for each car in consideration as a final value. This tool also recommends one car based on the lowest cost of ownership among the cars in comparison. This diwali make sure to compare your prospective cars on basis of total cost of ownership for 5 years before making a buying decision. Droom.in is also offering many festive deals on used bikes, scooters, and cars this Diwali. So, hurry up. Offers valid for limited time only.